Decade-long study involving 21 million smallholders shows how evidence-based approaches could improve food security. 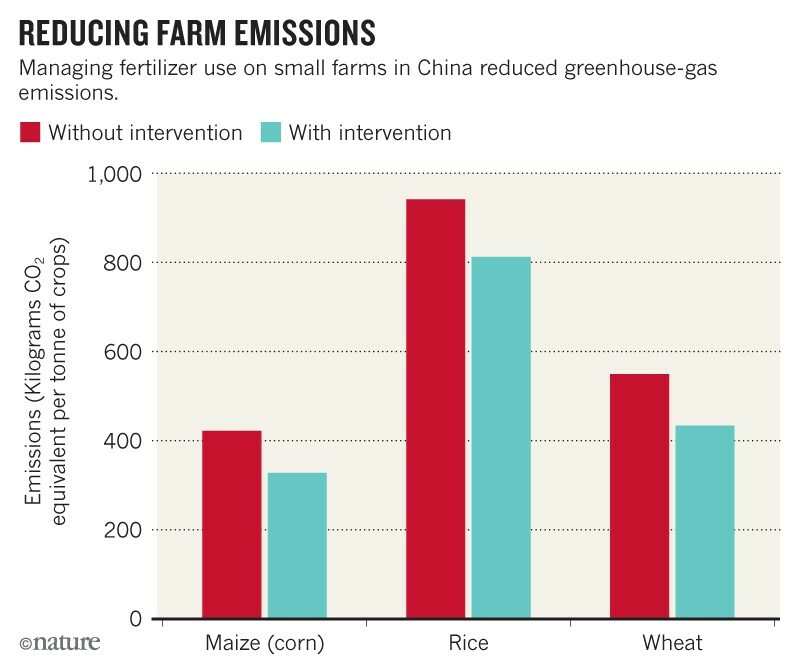 A landmark project to make agriculture more sustainable in China has significantly cut fertilizer use while boosting crop yields on millions of small farms across the country, researchers report in Nature1. As part of a decade-long study, scientists analysed vast amounts of agricultural data to develop improved practices, which they then passed on to smallholders. Through a national campaign, about 20.9 million farmers adopted the recommendations, which increased productivity and reduced environmental impacts. As a result of the intervention, farmers were together US$12.2 billion better off. The scale of the project has stunned international scientists. With the global demand for food expected to double between 2005 and 2050, they hope that the study’s lessons can be applied to other countries. “This is an astonishing project of a scale way beyond anything I am familiar with,” says Leslie Firbank, who studies sustainable intensification of agriculture at the University of Leeds, UK. Charles Godfray, a population biologist at the University of Oxford, UK, says that, over the past 30 years, China has achieved an agricultural miracle by producing enough food to feed the vast majority of its 1.4 billion people. But this feat has come at a tremendous cost to the environment, he says. Fertilizers, such as nitrogen, have increased crop production but have also acidified soil, polluted water and contributed to global warming. Godfray says the latest study demonstrates that it is possible to reduce fertilizer use while increasing economic returns on a large scale. 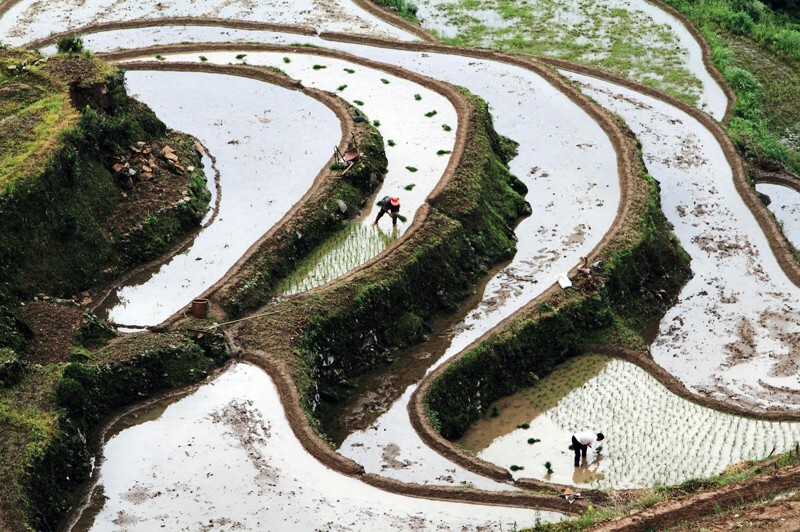 Chinese farmers use about 305 kilograms of nitrogen per hectare a year, which is more than four times the global average. Project leader Cui Zhenling at the China Agricultural University in Beijing and his collaborators took up the challenge to cut that use without lessening farmers’﻿ yields. From 2005 to 2015, the project team conducted 13,123 field studies at maize (corn), rice and wheat farms across the country, from the subtropical south to the frigid north. The researchers tested how yields varied with different crop varieties, planting times, planting densities, fertilizer and water use. They also measured sunlight and the effect of the climate on farm production. With data from the field trials, Cui and his colleagues developed evidence-based advice that was given to farmers on the basis of their local conditions. For example, the team recommended that rice farmers in northeast China reduce their overall nitrogen use by 20% on average, while increasing the nitrogen applied late in the growing season and planting the seeds closer together. Almost 21 million farmers adopted the group’s recommendations between 2006 and 2015. In that period, crop production for each grain increased by an average of around 11%. The study’s collaborators also recorded a surprising drop in fertilizer use — about 15% per crop — saving 1.2 million tonnes of nitrogen. “The demonstration that reducing inputs can actually boost agricultural, environmental and economic performance at scale is very important,” says Godfray. A combination of outreach programmes and workshops —﻿ about 14,000 over 10 years — helped to convince the farmers to adopt the recommendations. “The [farmers] were sceptical, but we gained their trust, and then they depended on us — that was our greatest reward,” says Cui. The project, which also provided on-site demonstrations and high-quality seeds and fertilizers at some sites, cost around $54 million. To enrol and educate the farmers, more than 1,000 researchers across China worked with 65,000 bureaucrats and technicians at provincial or county agricultural agencies and with 140,000 representatives from agriculture businesses. The project’s success highlights the importance of the vast social networks, says Jules Pretty, who researches the environment and society at the University of Essex in Colchester, UK. David Tilman, an ecologist at the University of Minnesota in St Paul, says the study is a rare example of scientific knowledge being properly implemented in farming. “The greatest barrier to sustainable agricultural is getting farmers to adopt more efficient practices,” he says, adding that the project offers a path for other nations to follow. But some researchers think the project’s lessons may be difficult to translate to other regions. China’s improved yields resulted from reducing fertilizer overuse, but many farmers in low- and middle-income countries don’t have access to enough fertilizer, says Godfray. He says that China’s centrally controlled government is uniquely capable of implementing policies across the country, which is not the case in other regions. “It would clearly have benefits across sub-Saharan Africa, but an approach is needed that crosses borders, organizations and funders,” says Firbank. Cui, Z. et al. Nature http://dx.doi.org/10.1038/nature25785 (2018).